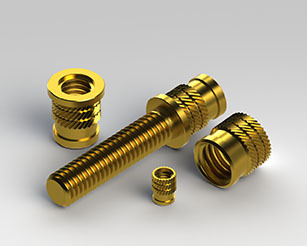 A brass threaded bush to be pressure installed, which is anchored by expansion when thread of the screw is inserted. This part can be extensively used when high torsion torques and tensile stress loads are required on plastic materials, compound materials, etc. A brass threaded bush to be pressure installed. 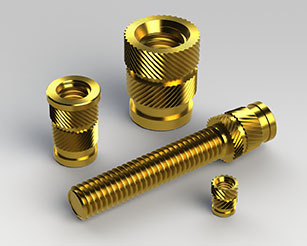 Part anchoring takes place by expansion when thread of the screw is inserted.Available in different versions for thermoplastic and thermosetting assembly applications. 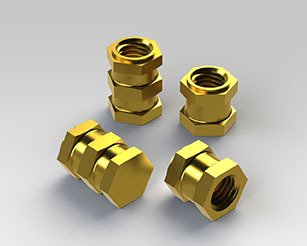 Threaded brass bushes and studs to be pressure installed, particularly suitable for stiff thermoplastic material assemblies.Their external geometry ensures perfect anchoring to the receiving material. 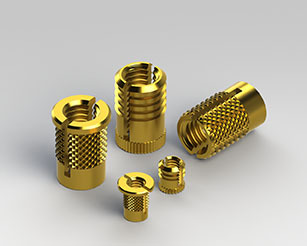 Threaded brass bushes and studs with a special external design in the position to ensure safe and tight anchoring on plastic materials, as well as very high tensile stress and torsion strength properties.These parts may be assembled either by ultra-sounds, or heat, or may be moulded and sealed together with the material to be assembled. 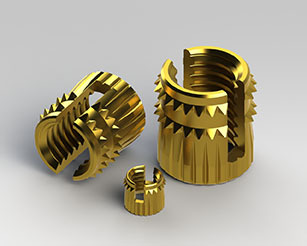 Self-threading metal bushes with special internal and external threads provided with particular tapping splits or holes.These parts are particularly suggested for lowstrength materials requiring seats with high strength properties against tensile stress and wear. 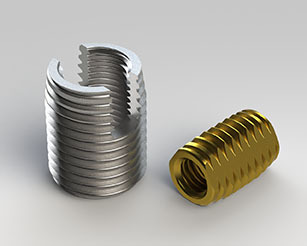 These parts may also be used for regenerating damaged threads.